JD McAaden is scared. His parents fight all the time. 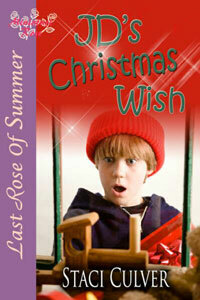 As JD writes his letter to Santa, he realizes that he'll give up everything if only his family can be saved. With the heart-rending innocence of a child, JD pins his faith on elves and the spirit of Christmas. A mysterious invitation to visit North Pole Village for the holidays is all that is keeping Faith and Taylor McAaden's marriage together. Faith has promised to give her son one last special outing before she sues for divorce. But in the magic atmosphere of hope, Faith and Taylor learn that love lurks even in the darkest hours and that with JD's Christmas Wish their family can be made whole again. Leigh Michaels has a secret… For years, she’s been in love with her best friend, Bryan. 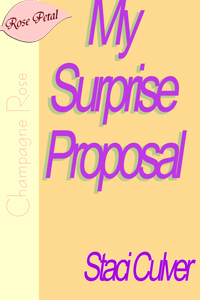 When he enlists her help planning his surprise proposal, Leigh is heartbroken. Pushing her sorrow aside, she agrees to help him, unaware he has one more thing to ask of her. Five out of five stars from The Wild Rose Press! “Staci. Very sweet little story. Thanks for sharing. Enjoyed your character Leigh as she struggled to keep Bryan in her life. The old saying, "If you love something, set it free. If it comes back, it's yours. ", is alive and well in your story. Yea for happy endings!." Work in progress and part of an Arkansas-based anthology with fellow Arkansas romance writers. Fate lands dejected single-mom Ashley Sutterfield in the small town of Altus, Arkansas. She goes to work at a local cafe, and for the first time in more years than she can count, her life is drama free...until Blake Buchannan returns from a ten-year stint in the military and throws her peaceful life into a tailspin. Fighting Blake’s advances and the kindred connection she feels expanding in her chest every second she’s in his presence, Ashley stands her ground all of one hour before a sizzling kiss sends her better judgment fleeing into the nearby Ozark Mountains. Not everyone, however, is happy about the budding relationship. One of Blake’s crazy ex-lovers isn’t about to stand by while an "outsider" steals him away, and she’s prepared to do anything—even commit murder—to keep Ashley from claiming Blake. Abigail Wade, businesswoman and financially wobbling single mom, doesn’t mind navigating the torrential waters of single life, especially after a bitter divorce and her husband’s desertion while she carried their second child. At least she didn’t mind the solitary existence until enigmatic army Staff Sergeant Heath Grayson struts into her life and jumpstarts her heart. The catch: Heath’s body language says he’s interested, but his words don’t. Tired of playing cat and mouse, Abby decides to take matters into her own hands. If he couldn’t protect his younger brother, how is he supposed to protect Abby and her sons?